Clifford’s funeral service will be 11 a.m., Friday, January 18th at the Wallace Family Funeral Home in Newton. Pastor Chad Jennings of St. Luke United Methodist Church in Newton will do the service. The family will greet friends from 4-7 p.m., Thursday, January 17th at the funeral home. A private family burial will be held at the Dunreath Cemetery in rural Monroe. Memorials to the Emerson Hough Chapter of the Izaak Walton League or to the Jasper County Historical Society may be left at the funeral home. If mailing the memorial to the funeral home, please add, Attn: Simbro Family on the envelope. Clifford Dwaine Simbro, the son of Earl and Bessie Wagner Simbro was born on February 9, 1929 in Monroe, Iowa. He was a graduate of Monroe High School in 1947. On July 15, 1950, Clifford was united in marriage with Patricia A. “Pat” Marshall in Mt. Ayr, Iowa. They were blessed with four children, Kalven, Joyce, Kris and Carroll. Clifford worked for the Iowa Department of Transportation, retiring in 1992. He was a long time member of the Emerson Hough Chapter of the Izaak Walton League. Clifford’s favorite thing over the last 45 years to do was cooking breakfast on Sunday mornings for all of his family. Everyone enjoyed his breakfasts, especially the pancakes. He also enjoyed tractor rides, tractor pulls, cutting wood, woodworking projects, fishing and cooking. Clifford died surrounded by the love of his family on Sunday, January 13, 2019 at the Skiff Medical Center in Newton. He was 89. 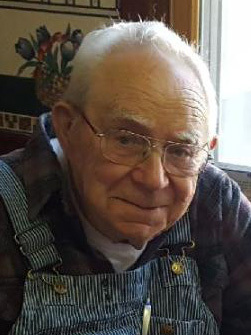 He was preceded in death by his parents; wife, Pat in 2016; daughters-in-law, Shari Simbro and Janie Smith; brother, Bernard Simbro; and sister, Coral Lee Marshall. Those left to honor Clifford’s memory are his children, Kalven (Beth) Simbro of Baxter, Joyce (Jerry) Kingery of Newton, Kris (Sandy) Simbro of Newton and Carroll (Jill) Simbro of Newton; nine grandchildren, 15 great-grandchildren, his sons he loved like his own, Stephen Smith of Baxter and Merle Smith (Roxanne Van Ersvelde) of Newton, along with Stephen’s two sons and four grandchildren; sister-in-law, Mary Simbro of Reasnor; and brother-in-law, Eldon Marshall of Monroe.